Waiting on First to turn right across the river: The bridge is still far off. One of the advantages of living in a small town is supposed to be the lack of congestion. So how come in Albany we’re now spending so much time in stop-and-go traffic? There seem to be at least two bottlenecks on the way into and out of town. Lots of afternoons, traffic from Corvallis and North Albany backs up on Highway 20, waiting to get across the Ellsworth Street Bridge. 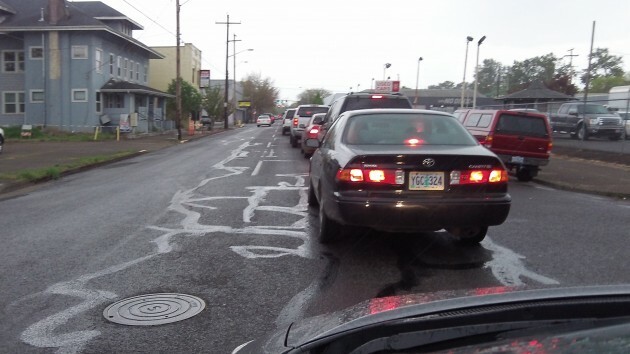 At about the same time of day, the line of cars in the right-hand lane of First Avenue gets long and longer with vehicles stacking up for several blocks, waiting to turn right across the Lyon Street bridge and then continue north or west. I know this is nothing compared to the daily routine in bigger towns. Still, it’s more than you’d expect in the bucolic environs of the mid-Willamette Valley. Nothing can be done about the width of the Ellsworth bridge. Two lanes are all it’s going to have as long as it stands. But maybe the downtown signals could be modernized. If they reacted to traffic flow, they could better accommodate the increasingly heavy afternoon traffic. And the pedestrian walk signal at Ellsworth and First might be changed so that walkers – especially slow strollers – would no longer prevent right-hand turns off the bridge, thus holding up a column of traffic that may be quarter-mile long. On First Avenue approaching Lyon, one way to speed up right-turning traffic would be to stripe for three lanes on the Lyon Street bridge. It would be tight, and the bike lane would have to be shifted to the sidewalk. But that would allow a continuous green signal for right-hand turns on to the bridge from First. James Carville once said “the economy stupid.” Certainly not called you stupid HH!! at 5% unemployment and not the fictitious 20% that Trump spews. More roundabouts or grin and bare it until the economy tanks again? There’s another option for the First —> Lyon bridge right turn. Leave the far left lane alone but make the second lane from the left an optional right turn lane and keep the present right turn lane (3rd from the left) in place. Of course painted lines to “guide” people into the proper lanes would also be necessary. It’s an easy and cheap fix that would allow more cars per light to turn onto the bridge when the light changes. As a bicyclist, I like the sidewalk idea, and have ridden the sidewalks on both bridges. The barriers between me and the cars are nice to have. We’re lucky that Oregon doesn’t share California’s compulsive separation of bicycles and pedestrians almost everywhere. Are those bridge sidewalks legal? I’m a recovering Californian (16 years) and still feel a little uncertain of the rules in some places. I like HHs thoughtful proposal. More thought provoking than some I’ve heard.